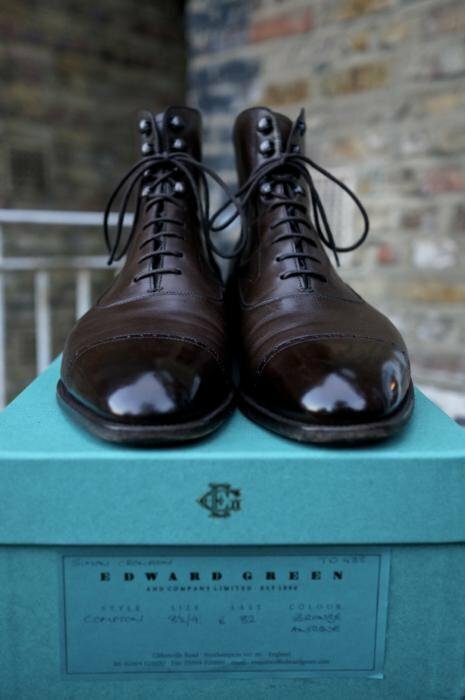 An archive-trawling reader recently reminded me that back in November 2011 I wrote about my new Edward Green Top Drawer boots, concluding that perhaps it would be best to wait two years and then see how the boots had worn. So what have I learned in that time? Well, the leather continues to outperform that of other Edward Green shoes. It takes a polish beautifully, instantly bringing up a rich shine and achieving a mirror-like finish with a little extra work. The only shoes I have that are comparable in that regard are from Corthay, though that construction is also rather stiffer. The waist treatment continues to appeal. I like the rounded shape more than the sharp angle of some Gaziano & Girling shoes, for example. It feels natural and less affected. However, close as the waist is, it does not compare with bespoke shoes, and neither does the pitch of the heel. As I have written before, those two things are what give bespoke shoes such elegance and grace, and for me are a greater draw than bespoke’s superior fit. If I could find such work on a RTW or MTO shoe, that might be the ideal. The boots have worn well, though no better than any other of my Edward Green shoes. Perhaps two years is still too short a time, though. I rarely wear boots for the middle six months of the year, and the rest of the time they must compete with a large shoe collection. The only thing that was slightly disappointing was that the loop for pulling on the boots came off at one end. I haven’t seen any other signs of poor workmanship – quite the opposite in fact, in everything from the heel build to the waist-to-heel transition to the linings. But it shouldn’t happen nonetheless. 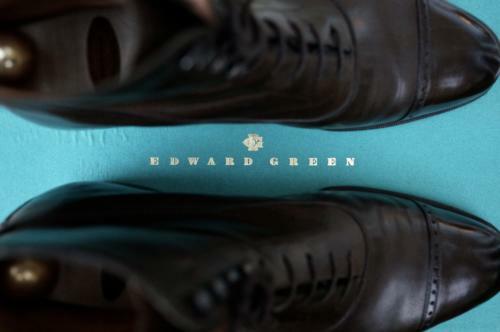 I can see how a Top Drawer shoe would appeal to a long-time fan of Edward Green who wanted something just a little better. You definitely get that. But, with Top Drawer starting at £1350, you’d need to not miss the extra £600 or so. Top Drawer also shouldn’t be seen as halfway to bespoke, either in make or obviously fit. You can follow the discussion on Edward Green Top Drawer by entering your email address in the box below. You will then receive an email every time a new comment is added. These will also contain a link to a page where you can stop the alerts, and remove all of your related data from the site. How do you wear boots? As a younger man i tend to only wear boots with more casual trousers, and roll up the trousers so the bottom of my trousers reaches the top of the boot, I think trouser over boot creates a bizarre look and slightly defeats the purpose of wearing them? No differently to regular shoes really. I don’t roll trousers up and I’m happy to wear with suits etc. They go particularly well with more casual cloths though, such as flannel. And with odd jackets and trousers. As long as it’s subtle it can work. You have to be wearing pretty skinny trousers (which I don’t, generally) to have a problem with tightness on the boots though. Is G&G Deco the closer halfway house to bespoke? Yes, it is closer – on elements such as the heel for instance. But I would still say it shouldn’t be bought as an alternative to the finish of bespoke. 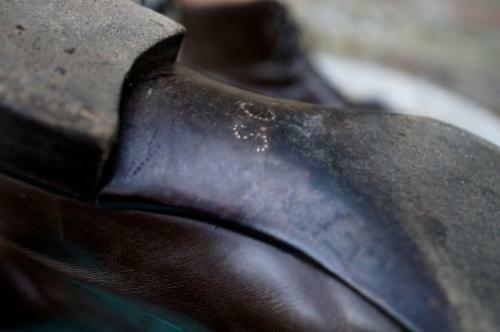 Are Top Drawer shoes hand welted? It’s interesting to see the comments about bespoke vs G&G Deco vs EG Top Drawer. Regarding closeness of the waist and heel pitch I can’t comment on the heel but for the waist I would have thought that it does depend to some extent on the customer. A waist can only be as tightly sculpted as one’s feet allow so a customer with badly fallen arches and correspondingly flat feet might not see a significantly closer waist even with bespoke, or have I misunderstood what you mean when referring to the closeness of the waist? Regarding Deco vs Top Drawer, I’m not in a position to compare but it’s always struck me that the way EG sells its premium service makes far more sense than G&G’s way. I like the fact that with Top Drawer I can select any last. It’s always seemed odd to me that if I want a higher level of finishing from G&G then I have to choose the Deco last and if I don’t like it (which I don’t) then I can’t get access to the higher quality level (except by going bespoke of course). It’s the reason my current pair on order are EG Top Drawer rather than something from G&G. By the way, you chose your time well when ordering your boots two years ago – I think you only waited about 4 months. My EG Top Drawer order was placed 9.5 months ago and I was quoted 10 months delivery when I placed the order. Here’s hoping that they are on time and will be ready in the next couple of weeks. May I ask about shoe trees going into boots? I have a paid of ankle boots that I like very much, but when I started putting generic trees in them, they pushed the back of them out and left a swelled-out mark behind the ankle, so you could see where they had been? Is that because they’re rubbish or should one use special trees with boots? It doesn’t look like the ones here are any different to normal trees, or am I wrong? Have you perchance had any experience with Bestetti? Things like tightly sculpted waists and pitched heels seems to be part of his repertoire on RTW models as well as bespoke. I see on the box and in your original article that the style name for these boots is “Compton”. I can’t for the life of me tell the difference between these and the Shannon that EG currently list as a boot style. What am I missing or is this simply a change of name for exactly the same style? Thanks Simon. It sounds as if the Compton might well be the one for me. One follow on question… What is “gimping” in this context? Thanks for the explanation re gimping Simon. I got my Top Drawers (Holborn derbys) on Thursday and I’m really happy with them. My only complaint is that EG somehow neglected to call me to tell me they’d arrived so they’d been sitting in the shop for 4 weeks. It’s lucky that I called in while passing the shop to check the status of the order. One thing that I noticed when comparing my new TDs to my G&G MTO Grants is that the calf leather on my EGs is much thicker than the calf leather on my G&Gs, at least 50% thicker. The TDs are a superb fit even after the first 4 hours of wearing in the house and I just love the EG 888 last, for me it has just the right amount of contemporary feel to it without becoming overly long and pointy which the G&G TG73 last does on my narrow feet. If I tried G&G again I’d try the MH71 last and the Decos would be an absolute no-go for me but I think I’ll stick with EG. I probably shouldn’t mention this since I don’t want too many people in the queue competing with me but the lead time on Top Drawer has come down from the 10 months that I was quoted in January this year. EG quoted me a 5 to 6 month lead time when I checked on Thursday. For me the extra cost of TD over MTO is worth it because the tighter waist is exquisite. I’ll be placing an order for a couple more pairs in January, one will be a Compton; it’s a shame they missed the “r” out of the name, you almost had an EG boot style named after you. Thanks Julian. I agree on the thickness of the TD, which I like as well. One question for you Simon plus a snippet of info for anyone interested in EG MTO/TD that I forgot to mention in my last comment. The info is … I asked EG my usual question when I was in the Jermyn Street shop on Thursday: “Have you added any hatch grain options to the material choices?”. They usually say “no, we don’t do that” but this time I was told that in August or September next year they are planning to add quite a few textured leather options including some hatch-grains and pin-grains. That’s one advantage that I’ve always thought that G&G have. Hatchgrain can be a nice way to tone down the formality of certain styles without going too “country” which is where EG’s current country calf can lead. I’d be interested in your thoughts on hatch grain, some people seem to like it and some hate it. Some of the pictures of G&Gs that I’ve seen made up in hatch grain have looked great. My question relates to your choice of the at-that-time new “bronze” colour for your boots rather than the more usually seen EG “dark oak” colour. Was there any particular reason apart from wanting something a bit different? Two years on do you have any thoughts on the flexibility of the bronze colour vs. something like dark oak? Right now I’m just starting my decent shoe collection and gradually emerging from my business-attire mindset of all black shoes. 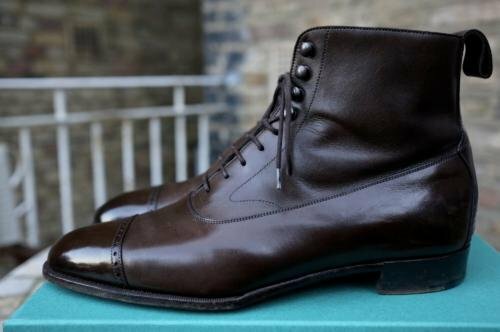 There are almost no brown shoes in my wardrobe so I don’t have a great need to do anything different relative to what I’ve got already but if in your opinion there are specific pros and/or cons of the bronze then it would be interesting to hear about them. It’s probably all down to personal taste I suspect. I was wondering whether you use heel and/or toe taps on your EG’s or any of your other shoes? If so, why? If not, why not? Thanks! What is the specific color of these boots? They do not look to be dark oak. Can you provide the exact name? I was going to order through TD.